The organizers of New York Yacht Club’s first Annual Regatta in 1846 would have been hard-pressed to envision that it would become an annual event about to be run for the 161st time. The New York Yacht Club Annual Regatta presented by Rolex is now a cornerstone of the summer sailing season. 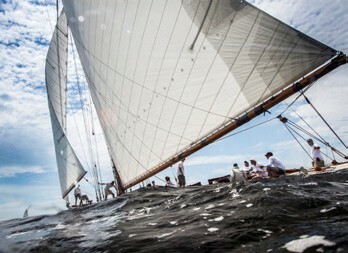 From that first race which featured 14 entries (sloops and schooners) to the mix of vintage and modern craft that will cross the starting line in Newport, RI for three days of racing from June 12-14, 2015 the constant thread has been upholding the tradition of competition and camaraderie which is fundamental to the sport of sailing. Of the many modern one-designs that race by class division will be the Swan 42s, of which six are currently entered, with 2014 class winner Mahalo returning to defend her win. “Last year’s win was a very nice win for us,” said Mahalo’s owner Charles Kenehan (Swampscott, MA), who has been out of sailing for 20 years while raising triplets. In 2013, which he characterized as a “learning year,” he both purchased the boat and raced in the Annual Regatta. “I’m thrilled with the Swan 42 class,” said Kenehan. “The racing is extremely competitive, and now we’re hoping to take it to the next level.” Kenehan raced in the Mediterranean last fall and is focused on competition in the U.S. this year with an eye toward qualifying for the 2017 NYYC Invitational Cup. PHRF classes will sail “Navigator” races using government marks. Daily awards and social activities will complete each day’s activities at Harbour Court, NYYC’s on-the-water clubhouse in Newport. For a full list of entries and additional information, visit nyyc.org. For more information, contact NYYC Racing Director Brad Dellenbaugh at dellenbaugh@nyyc.org or 401-845-9633. Barby MacGowan is President of Media Pro International in Newport, RI.